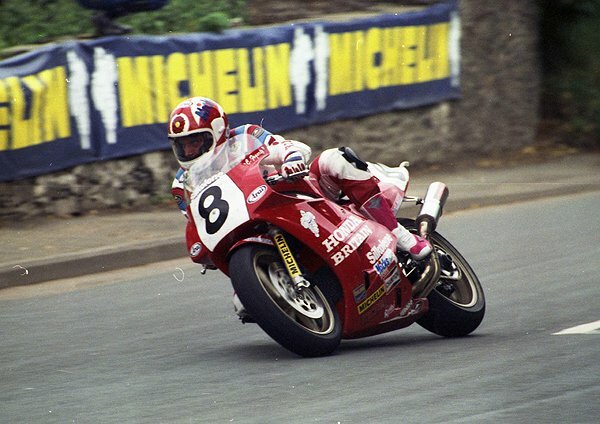 Having won the Newcomers Manx Grand Prix in 1985, the Blackburn racer was a star turn at the Isle of Man TT Races between 1986 and 1992 taking three wins and seven podiums as well as the outright lap record in 1992, his speed of 122.61mph remaining unbroken for seven years. It was his rides in the World Formula One Championship that initially made his name, battling with Joey Dunlop in each of his World Championship winning years, with wins at the TT coming in the 1989 750cc Production, 1990 Formula One and 1990 Senior Races. It's perhaps his runner-up spot to Steve Hislop in the 1992 Senior Race, voted the greatest TT race of all time, that he's most fondly remembered for however. That race saw Foggy swap the lead with Hislop throughout the six-lap race and although he eventually had to settle for second, just 4.4s behind the Scot, he did have the consolation of claiming the outright lap record on the final lap. Fogarty, of course, went on to become the most successful World Superbike rider of all time with 4 world titles and 59 world championship race wins before injury ended his career early in 2000 but he's always maintained his relationship with the island, not only stating his love for the Mountain Course but also how his race wins remain the most special out of all his successes. "The Isle of Man holds a special place in my heart and I have said many times before that it was that part of my career which I look back on with the most happiness and pride. I can't wait to see the new Classic TT event for myself after hearing good things about last year's first event and I am particularly excited to be part of the tribute to Joey Dunlop. Joey was a special rider and someone I looked up to and wanted to beat in those early World Championship years." Carl will also be attending the Classic TT VIP Hospitality events and RST Heroes Dinner. or by phoning 00 44 (0)1624 640000.